Dog-sledding is one of the most exhilarating things I have ever done in my life. 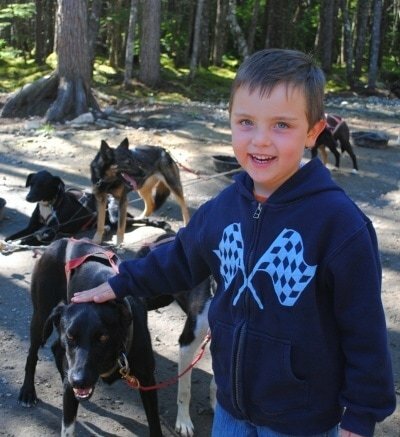 I led a pack of four dogs through the Canadian wilds a few years ago and I have wanted to share this experience with my kids ever since. 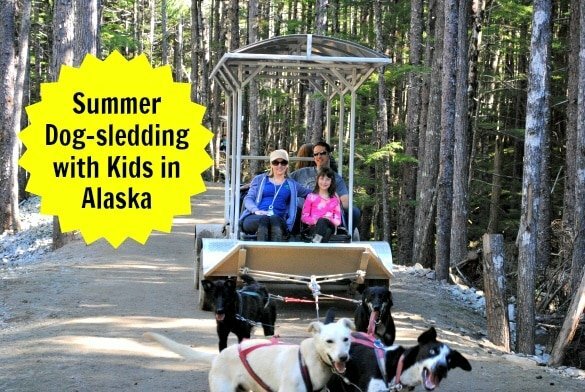 When I signed up for our Alaskan Celebrity Cruise this past summer, dog-sledding was on my family’s must-do list. The cost to helicopter to a glacier for a snowy dog-sledding adventure was too far out of our budget so we opted for summer dog-sledding in Skagway, Alaska instead. 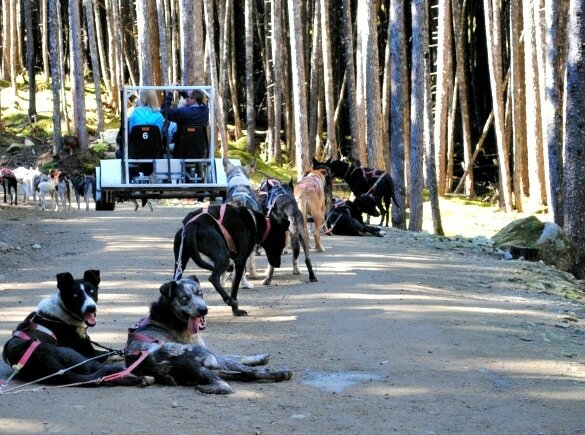 With the Dogsled & Mushers Camp Experience through Celebrity Cruise Line, vacationers take a shuttle to the outskirts of Skagway, where downtown once resided before it was broken down, packed up and reassembled in its current location near the sea. I suggest boarding the shuttle early because we had a difficult time understanding the tour guide’s commentary from the back of the bus about the Iditarod, Alaska, and Skagway. 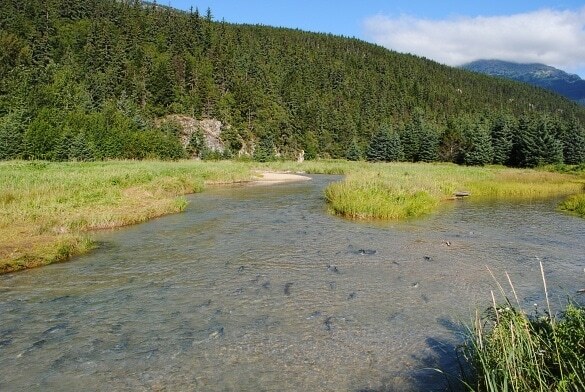 Upon arrival at the base of a small mountain, our group meandered past a stream ripe with salmon. These were the old fish lucky enough to make it to the end of their life’s journey. Battered and tired, they wobbled in the water. Although we did not come on this excursion to see salmon, it was a highlight of our day to witness such a triumph—these were the fish who traveled back to their birthplace to procreate, overcoming all odds to continue their species’ survival. Who could not stand in awe of such a feat? Watch a brief video of the spawning salmon now. It is illegal, we learned, to fish for spawning salmon. You wouldn’t want to eat these old souls anyway. One of our guides pointed out that these fish war heroes were too worn out for proper eating; better to fish upstream for new recruits. In the distance we saw a group on horseback and my horse-loving strings were strummed. 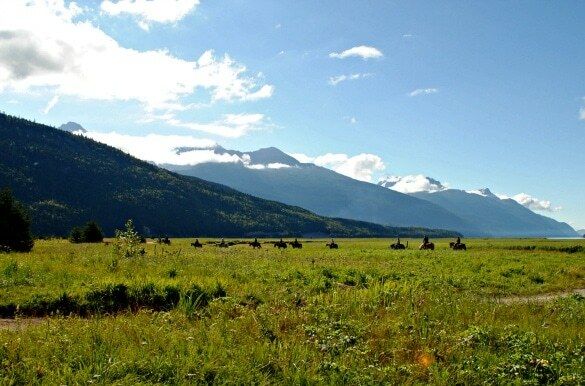 Oh to experience Alaska’s beauty from the seat of a saddle. Next time…! My family and the other excursioners boarded a specialized all-terrain vehicle that trudged and roared its way up the steep incline to the summer dog-sledding camp. The dogs are not what you’d expect. These are not the thick, fluffy dogsled dogs of Hollywood movies. They are Alaskan huskies, which are basically mutts—a blend of Siberian husky or malamute often bred with greyhounds for speed and endurance. They are a slender breed of dog that craves the run. They jump and pull and howl with excitement at the idea of escorting riders through the snow or sun. When dogs retire, they often become mushers’ pets. After years of bonding as trusted sledders, owners don’t want to let beloved dogs go. The dogs here in Skagway were much gentler and more keen to be cuddled by humans than those I met during my snowy Canadian dog-sledding adventure. My children loved petting the dogs and picking out their favorite canine from the crew. After the educational lecture, it was time for the puppies. Everyone was given a chance to snuggle with some incredibly adorable someday dog-sledding pups. Crimi’s daughter, Dakota, was happy to show off the camp’s newest dogs. This was my kids’ favorite part of the whole day! Our excursion ended with a choice: a stop in downtown Skagway or head directly back to the ship. We chose to explore the town, of course. The buildings appear to have been plucked from a Hollywood set for “quaint American town.” Souvenir shops abound, all of which sport unsavory price tags but plenty of charm. (If you’re looking for souvenirs, I suggest buying them in more affordable Ketchikan instead.) 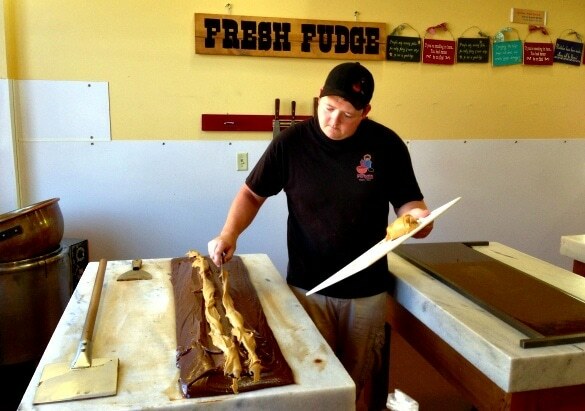 Be sure to stop by the Alaskan Fudge Company for a sweet treat of handmade fudge to bring back on board the ship…if you can wait that long! In winter months, this too-good-to-be-true town isn’t. 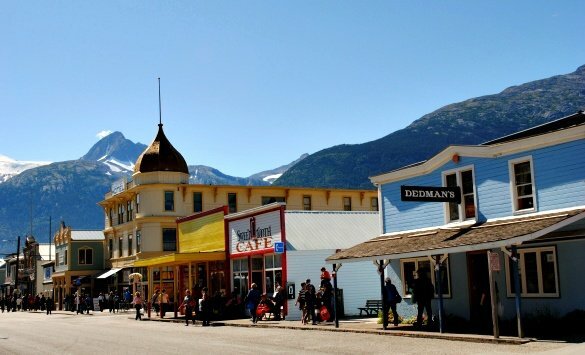 Skagway’s downtown exists primarily during summer months to appease tourists and most of the businesses close down during the chill of winter. Our summer dog-sledding adventure was by-far the most exciting and memorable day of our Alaskan cruise for every member of the family. Was it as intense as driving my own team of dogs through the snowy Quebecois wilderness? Not by a long shot. Was it still thrilling and fun? You bet! If dog-sledding isn’t yet on your bucket list…add it! Would you like to go dog-sledding in Alaska? Let us know in the comments below! A Note from The Travel Mama: My family’s Alaskan cruise was hosted by Celebrity Cruises. We paid for all excursions ourselves. All opinions are my own, as always. We had a very similar experience with Mitch Seavey’s dogs outside Seward. He had over a hundred dogs at this site. He won the Iditarod a year or so later and has written a book on training dogs for racing. We have plenty of puppies for you to hold and lots of wonderful older dogs who’ll enjoy your affection too. We are passionate about what we do and we know you’ll enjoy your time with us.